Before the internet, salespeople could have multiple identities. We remember times when the same person might have a business card saying they’re a healthcare specialist one day and an education specialist the next. Technology has increased transparency to the point that this is no longer possible. It’s less about your business card than LinkedIn profile or mobile-friendly website. These funny anecdotes about communication preference seem like small things, but they are the canary in the coal mine when it comes to market changes. The contract furniture industry is no different than many other industries being transformed by new technology and its ripple effect. We may be on the cusp of true reinvention and it will have a major impact on the value chain. Disruption does not come from within an industry – it usually starts somewhere else. For contract furniture, the seeds of change have been sown in the consumer market and purchasing behaviors. In 2012 U.S. shoppers spent $7.8 billion in retail via smartphones. In 2016, it was $60.2 billion. According to a recent Forrester study, that number is expected to be $93.5 billion this year, then almost doubling to $175.4 billion by 2022. A cursory view of the retail landscape reveals how the speed, convenience, and personalization of ordering online is winning over traditional models – suffice it to say Walmart has noticed Amazon. Offering mobile transactions is no longer about differentiation, it’s an expectation. For many industries, the main source of value is no longer a product or service, but an experience ecosystem. Consider the subscription economy, with 15% of online shoppers partaking in some sort of subscription service from Amazon to Blue Apron. The new currency is convenience, efficiency, and simplicity. Business-to-business markets can be slower to feel these effects, but the change is real. Where it used to be seen as premium, white-glove experience, B2B selling can seem slow and cumbersome by comparison. Some contract furniture competitors are rethinking how they go-to-market and deliver value. New entrants like Varidesk have taken a consumer approach to generate awareness and demand for their product, perhaps most famous (or infamous) for its ads in airline magazines. The X-Chair is another example, advertising in the Wall Street Journal instead of industry publications. 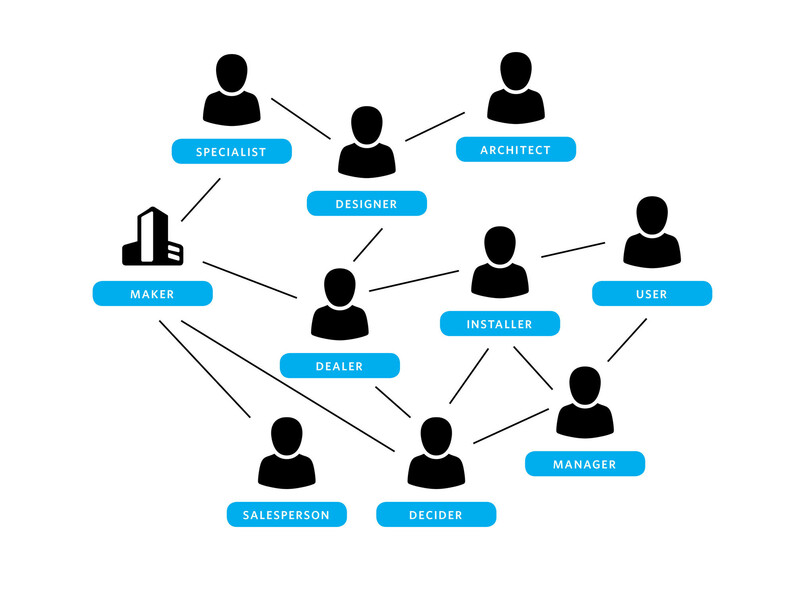 Going directly to end users creates a level of transparency and access that can challenge dealers and reps. It also creates a demand for products that might not be on the A&D menu, creating a new kind of customer pressure. With a more unique approach, Netherlands-based furniture company Vrienden is rethinking what a showroom can be through its FRIENDS program. The company believes design can be a tool for connecting people and products in a social setting. FRIENDS is a network of people who have made purchases and allow potential buyers to come and visit their space to check out the product and ask questions. The spaces range from homes to businesses. The FRIEND then gets a 10% fee if the visit leads to a purchase. In this model, Vrienden has leveraged trends from the gig economy and models similar to Airbnb and direct selling organizations. As a result, dealers and reps may be left out of the sale and A&D would have to rethink the way they gain information and interact with the end user and manufacturer. Increased transparency and access puts end users and manufacturers in direct contact with one another, forcing each member along the value chain to rethink how they go-to-market and the value they provide. Many manufacturers are caught on their heels as they find themselves in direct connection to end users. As more interactions happen digitally more emphasis is placed on the overall customer experience, something to which everyone contributes but no one is directly responsible. Internal departments have to think and act differently. Marketing, sales, IT, R&D, HR; they all have to collaborate and work together in ways that are unfamiliar, undefined, and sometimes a little uncomfortable. Emerging technology is creating new challenges and opportunities to find and deliver unique sources of customer value. Value chain players – rep groups, dealers and A&D – occupy what is perhaps the most volatile space within this shift, the middle between the manufacturers and end customers. Although it’s the most volatile, it’s also ripe with opportunity. Those in the middle are often most responsible for the overall experience. While they risk being unseated by the closing relationship gap between manufacturers and end users, they also have the access to reshape the customer experience altogether. Disruption in the contract furniture market has begun. Frictionless and seamless customer experiences win in this new economy. People aren’t buying products as much as they are buying into experiences.